The family consists of about 283 genera and 7300 species such as Ricinus communis. members of the family are distributed worldwide except in arctic regions. In Pakistan, the family is represented by several genera like Euphorbia, Croton (Jamalghota), Jatropha, Emblica (amla), etc. 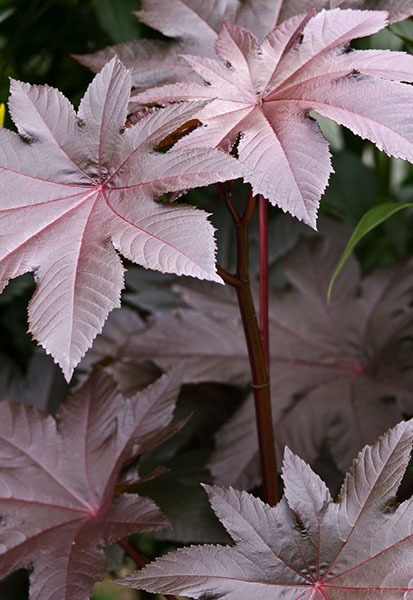 Ricinus communis is an annual or perennial shrub. 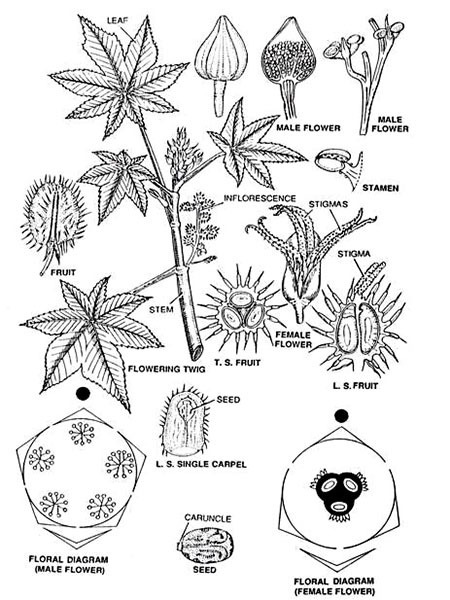 The seeds are source of castor-oil used variously in manufacture of transparent soap, typewriter ink, perfume aromatics, varnishes and paints. The seed cake is used as fertilizer. Petiolate, Simple, Alternate, Palmately lobed (7 – 9 lobes usually), Venation: reticulate multicostate, Leaf margin: serrate. Flowers arranged in terminal raceme. Both male and female flowers present in the same inflorescence. Female flowers are present near the apex and male near the base. Ebracteate, Pedicellate, Incomplete, Actinomorphic, Unisexual, Hypogynous. 5 stamens, each stamen profusely branched, Anther cells borne on ultimate branchlets, Anthers: basifixed. Tricarpellary, Syncarpous, Ovary: superior, trilocular, covered with spiny outgrowths and each locule contains a single large ovule, Placentation: axile, Styles: 3 and separate, Stigma; three each being bifid. It is a common annual weed. A glabrous erect annual herb or weed common in the field and gardens during winter. Herbaceous, erect, unbranched below but copiously branched above in cymose manner. Alternate on main stem, In whorls of 5s, 3s or 2s above, Petiolate (stalks short), Ovate, Venation: reticulate unicostate. Cyathium the male and female flowers are reduced. The flowers are borne in a Cup-shaped involucre formed by bracts. Bracteate, Naked (without perianth), Unisexual: represented by a pedicellate stamen, Anthers globose. Naked (without perianth), Unisexual: represented by a pedicellate 3-celled ovary present in the center of the involucre, Styles: three and free, Stigma: bifid. Manihot utflissima yield starchy foods from its tuberous roots. Wood oil, artists oil, and other drying oils, some of which are even better for pants than the linseed oil, are extracted from the seed of several species. Castor oil is extracted from the seeds of Ricinus communis and used as a lubricant and purgative. Groton oil from the seeds of Croton tiglium is also a purgative of extraordinary efficiency. The milky juice of many plants such as Manihot, Mercurialis, Euphorbias is a virulent poison. A considerable number of deadly poisons are produced from the exotic members of this family. Of these, some are expecially injurious through the stomach, others through wounds or when applied to the skin, and others are blinding to the eyes. Fruits of Phyllanthus emblica are edible and medicine.